The majority of applications that you try to install on your computer leave rubbish behind, that starts to accumulate on the system after the program is uninstalled. As a consequence of this, the computer starts to lose power and its performance deteriorates. 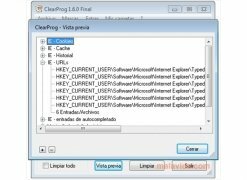 If you want to have an efficient tool to eliminate the trail that some programs leave behind, download ClearProg for free. It is a light utility with which you will save a lot of people a headache due to how badly their computer it working, because it is capable of detecting useless files that more than 250 applications store on all PC's during their installation and their use. Once they have been detected, you have to decide if you eliminate them. - Cookies, history files, temporary files, auto-completion forms, accessed URLs,..., and other data generated by the main browsers: Internet Explorer, Firefox and Opera. - Files from the recycling bin. - Recent elements from the Start Menu. If you want to maintain your computer clean and avoid that its performance diminishes, try out ClearProg for free.